Marcus Aurelius (121-180 CE), Roman emperor and Stoic philosopher, born at Rome, received training under his guardian and uncle emperor Antoninus Pius (reigned 138-161), who adopted him. He was converted to Stoicism and henceforward studied and practised philosophy and law. A gentle man, he lived in agreement and collaboration with Antoninus Pius. He married Pius's daughter and succeeded him as emperor in March 161, sharing some of the burdens with Lucius Verus. Marcus's reign soon saw fearful national disasters from flood, earthquakes, epidemics, threatened revolt (in Britain), a Parthian war, and pressure of barbarians north of the Alps. From 169 onwards he had to struggle hard against the German Quadi, Marcomani, Vandals, and others until success came in 174. In 175 (when Faustina died) he pacified affairs in Asia after a revolt by Avidius. War with Germans was renewed during which he caught some disease and died by the Danube in March 180. The famous Meditations of Marcus Aurelius (not his title; he simply calls them 'The matters addressed to himself') represents reflections written in periods of solitude during the emperor's military campaigns. Originally intended for his private guidance and self-admonition, the Meditations has endured as a potent expression of Stoic belief. 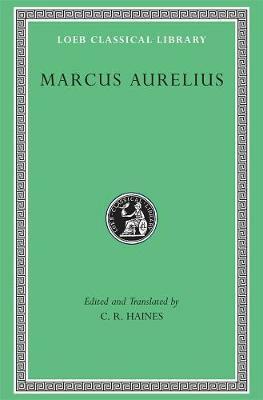 It is a central text for students of Stoicism as well as a unique personal guide to the moral life. Charles Reginald Haines (1876-1935) was Master of Dover College.